Image: From Amy’s personal collection, not to be copied without permission. Sounds like lots of good fun memories around the transistor! Amazing how the stereo was once the size of a piece of furniture and now you can just toss an ipod in a draw when you’re done listening to the music! I think we must be close in age, but I was the one with the radio and records. Memories of yore, in galore…………. I think that we had that same stereo! Some things in life are irreplaceable – and old radiograms and vinyl records are just two. This generation can keep their ipods etc. I’d almost forgotten about those old radios. Sounds like a century ago now, lol. Thanks for bringing that memory back to life. Your imagination makes it sound even more fun. Does not sound boring at all! We had a stereo like that, well almost. Those were the days, weren’t they, Amelita? Fabulous photo, Amy! 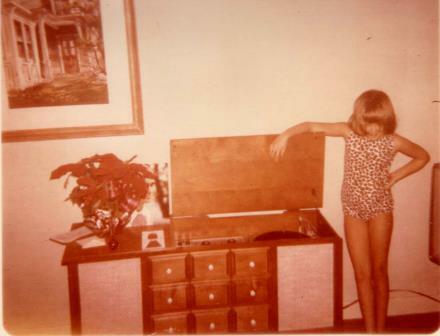 My parents and grandparents had “furniture” radio/record players in the 60s. And you’re so right, who knew what records to buy unless we first heard the songs on the radio? I had my first transistor radio at age 13. I hooked it onto the handlebars of my bicycle, and it was playing from early morning until after dark. I never got off of that bike–I think I even ate lunch on it…didn’t want to miss any of the tunes! There were two great music videos, as far as I’m concerned. One was “Take On Me” by Aha, and the other was ” Money For Nothing” by Dire Straits (I want my MTV…) You couldn’t hear those songs on the radio without picturing the videos in your mind. Nothing else was that memorable. You ended the poem perfectly: “Borrrrr-ring.” That’s what Lady GA GA and the rest of her ilk are to me. And you can’t just sing anymore…you have to also be dancing simultaneously…gyrating around the stage like someone who desperately needs to find a rest room within the next 15 seconds! Peter Pan on acid …. nice!! Wonderful poem. I used to love going through my parents’ old records. Staring at the Sgt. Pepper’s cover was the best. Oh it was so much fun back in the day – the lp’s, the 45’s. I’m with you TOTALLY on listening rather than watching a video which is so much about showmanship. Give me my music plain, please, so I can HEAR it without my mind being so busy! Love this Amy. I remember those honking big pieces of furniture! I promise, we had one! Great poem! I so agree! Our family had a radio like that, too, and I loved it. I was heartbroken when the record player part broke! As the youngest in my family by nine years, I mostly absorbed other people’s music until one day in 1966 when I absorbed my brother’s portable radio and carried it around with me all day, listening to “At The Zoo” and “It Takes Two” and “Western Union” all day long. My mother thought I must be sick, but I was just starting a lifelong love affair with music. Wage Peace. Sow Love. Never run out of words. Enter your email address to subscribe to receive links to Amy's poetry in your inbox! Your email box will NOT fill up anymore with comments!